If you know someone who loves the combination of coffee and chocolate, a tin of these would make an excellent holiday gift! In texture these are like buttery rich shortbread, but that's where the resemblance stops because these little rounds are so intensely flavorful that you're not thinking shortbread when you bite into one.. Packed with the deep flavors of espresso and bittersweet chocolate, I would say these are more of an adult cookie, except for the fact that I have seen certain small children happily munching away on them. Go figure! Ok, so we've established that these are pretty divine to eat, now let's talk about the unusual way these come together. If you're the kind of person who stresses about turning out perfectly formed cookies each and every time, you will love these because there is a foolproof way that ensures you wind up with a batch of identical disks. The secret is using muffin tins. Yup, that's right. Plain old, standard, reliable muffin tins. After you've rolled out the dough and chilled it, you simply use a cookie cutter to cut out rounds, pop them into the muffin cups and bake. So easy!! 1. Dissolve the espresso and let cool to lukewarm. If you want to speed the process along, stick it in the fridge for about 10 minutes. 2. Use an electric mixer to beat the butter, sugar and salt together on medium speed for about 3 minutes, until well blended, scraping down the sides of the bowl as necessary with a rubber spatula. Mix in the vanilla and cooled espresso mixture on low speed. Add the flour and pulse the mixer to slowly begin incorporating the flour into the dough (so that it doesn't fly everywhere). When enough flour has been mixed in, turn the mixer to low speed until there is barely a trace of flour visible. You don't want to over mix. Using a rubber spatula, add in the chopped chocolate and mix until all of the chocolate is mixed in and none of the flour is visible. 2. Divide the dough in half and flatten into 2 disks. Place each half between two pieces of parchment paper and use a rolling pin to roll the dough out to ¼ inch thickness. Slide the dough still in between the parchment paper onto a baking sheet. Repeat with other half and stack it on top of the first slab. Place in the freezer for 1 hour or in the fridge for at least 2 hours. At this point you can either store the dough well wrapped in the freezer for up to a month or in the fridge for up to 2 days. 3. 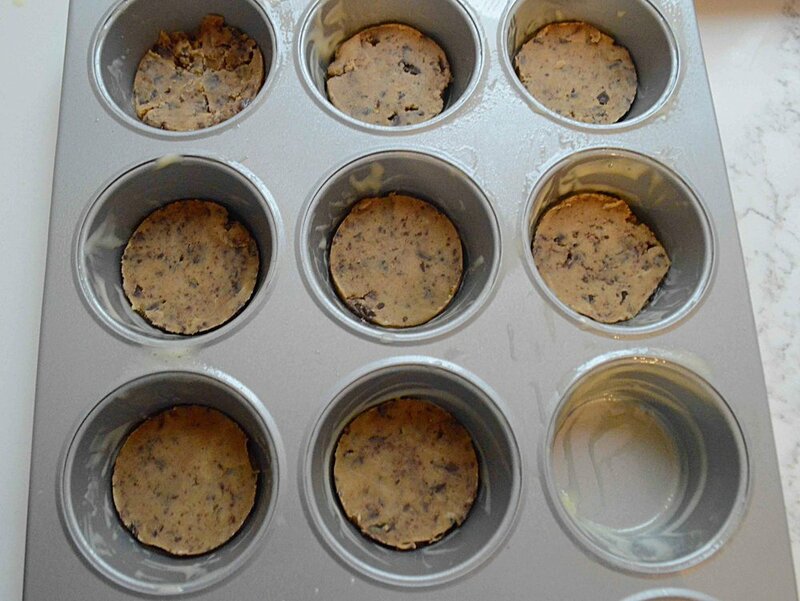 When ready to bake make sure oven rack is centered and preheat to 325º F. Butter or spray 2 standard size muffin tins. 4. Remove one of the dough slabs from the freezer or fridge and peel away the top piece of parchment. Loosen the dough from the bottom piece but leave the dough on top of it. Use the 2-inch round cookie cutter to cut as many rounds as possible from the dough and drop the rounds into the prepared muffin tins. Gather together the scraps, re-roll, chill and cut out more cookies. 5. Bake for 18-20 minutes, until cookies are firm and have browned a bit. Place the tin on a wire rack and let cookies cool in the tin on the rack for at least 10 minutes before carefully removing them to finish cooling on the racks. 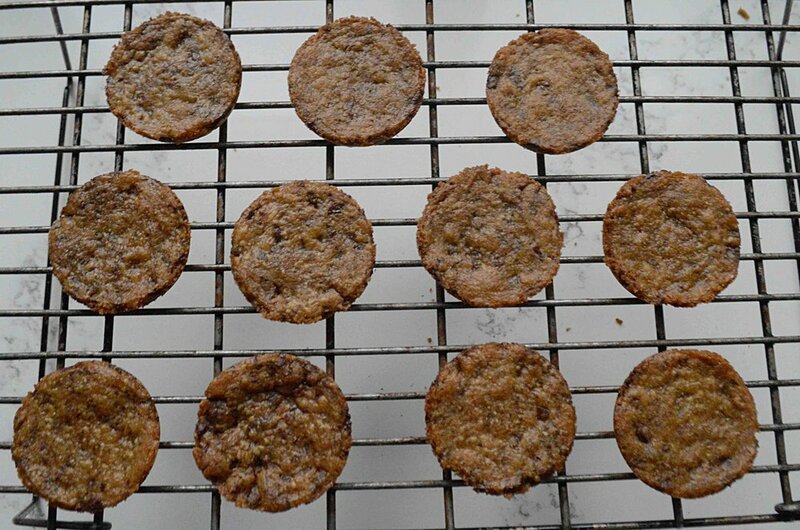 If you only have one tin, let the tin cool completely before placing unbaked cookies in it. 6. Cookies keep in an airtight container at room temperature for about 5 days. Note: Recipe adapted from Dorie's Cookies by Dorie Greenspan. I left out the cinnamon and simplified some of the steps.